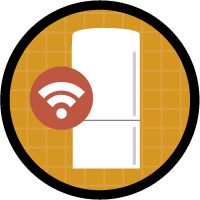 As an avid trailblazer I just have to Catch ‘Em All (Trailblazer badges) and the project to integrate Electric Imp in my fridge was a fun one. [caption width=“200” align=“alignnone”] Build an IoT Integration with Electric Imp[/caption] After buying an USB cable to supply it with power it now runs 24⁄7 and I get cases all the time, haven’t really tweaked the setup yet. I have looked at the new Platform Events and I thought that this integration can’t be using a simple upsert operation on an SObject, it’s 2017 for gods sake! Said and done, I set out to change the agent code in the Trailhead project to insert a Platform Event every time it’s time to update to Salesforce. In short it’s just fields to hold the same values as on the SmartFridge__c object. The updates to the agent code can be found on my GitHub account here. In Winter ‘18 you can use process builder on Platform Events but my developer edition is not upgraded until next Saturday. So I made things a bit more complex by introducing Platform Events and a trigger but I feel better knowing that I use more parts of the platform. Next step will be to use Big Objects to store the readings from the fridge over time and visualize them.